How will new coordinator put his touch on ISU’s offense? We've seen the last of Mark Mangino at Iowa State. Out with the old, in with the new. Iowa State shook up its coaching staff earlier this week, and Todd Sturdy will be implemented as the team's new offensive coordinator Mark Mangino. There was reportedly a disconnect between Mangino and head coach Paul Rhoads. Sturdy looks like more of an extension of the head coach, and there could be some differences in the gameplan with a new man in charge of play-calling. But what will the changes be? Well, Sturdy sure isn't going to tip his hand. “You can’t put the wishbone in,” the new offensive coordinator said. Thanks for that insight coach. 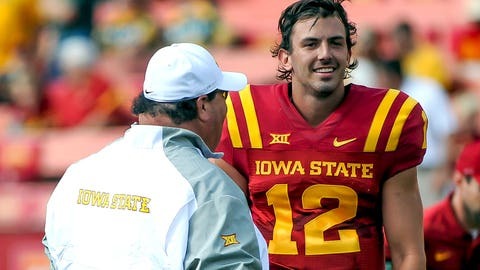 However, expect Iowa State's offense to be more reliant on the run with Sturdy at the helm.